Outraged U.K. lawmakers joined Prime Minister Theresa May in condemning President Donald Trump's retweets of unverified inflammatory anti-Muslim videos shared by extreme right-wing group Britain First. "Wouldn't the world be a better place if the prime minister could persuade the president of the United States to delete his Twitter account?" Peter Bone, a Conservative Party member of Parliament, told his colleagues, some of whom want May to rescind her invitation to Trump for a state visit. 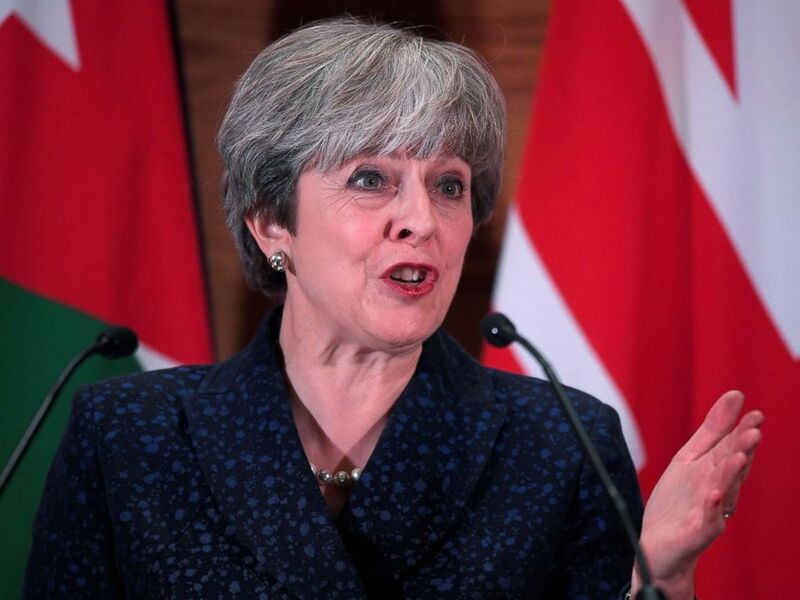 May, speaking to reporters today in Amman, Jordan, said, "Britain First is a hateful organization. It seeks to sow division and hate and mistrust in our communities. It stands in opposition to our fundamental values we hold as a country." "British Muslims are peaceful, law-abiding citizens who have themselves been victims of acts of terrorism by the far right," she continued. Where did the anti-Muslim videos retweeted by Trump come from? The U.K. is committed to fighting "the threat of terrorism and threat of extremism from whatever source it comes," May added. She emphasized that the relationship with the U.S. remains strong. "Let me be clear about the relationship between the United Kingdom and the United States. This is a long-term special relationship that we have. It's an enduring relationship that is there because it is in both our national interests for that relationship to be there. "But," she added, "the fact that we work together does not mean that we're afraid to say when we think that the United States has got it wrong … and I'm very clear that retweeting from Britain First was the wrong thing to do." The press corps in the room applauded. Asked about a future Trump state visit to the U.K., she said, "An invitation has been extended and accepted. We have yet to set a date." As the questions kept coming, she told reporters, "I have absolute confidence that members of my Cabinet will not be retweeting material from Britain First." Her comments followed a fiery urgent-question session in the House of Commons this morning called to discuss Trump's retweets. 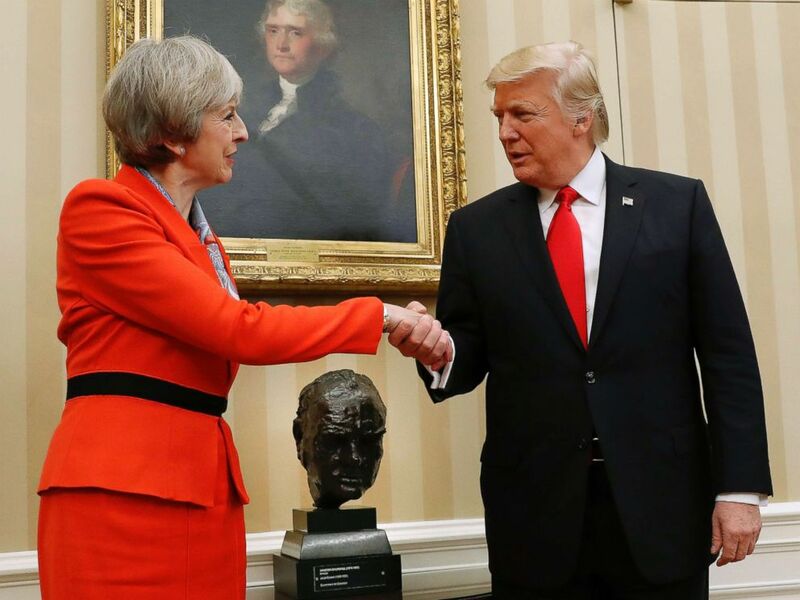 British Prime Minister Theresa May shakes hands with President Donald Trump in the Oval Office of the White House, Jan. 27, 2017. Early on Wednesday he retweeted three videos shared by Jayda Fransen, the deputy leader of Britain First. She has been convicted in the U.K. of religiously aggravated harassment and faces additional charges for a speech she gave in Belfast, Northern Ireland. Known for spreading anti-Muslim propaganda in the U.K. and posting Islamophobic videos, Britain First — a small, fringe group — holds protests and "Christian patrols" through London neighborhoods. The three videos Trump retweeted weren't posted sequentially, meaning he likely scrolled through Fransen's timeline and picked them out. He tweeted all three without verifying the content and without providing any commentary or context. Asked about the videos Wednesday, White House press secretary Sarah Sanders defended Trump, saying, "Whether it's a real video, the threat is real, and that is what the president is talking about. That's what the president is focused on, is dealing with those real threats, and those are real, no matter how you're looking at it." Across the pond, the backlash was swift. May released a short statement Wednesday saying, "It was wrong for the president to do this." President Donald Trump meets with Salman bin Hamad Al-Khalifa, Crown Prince of Bahrain, Nov. 30, 2017 in the Oval Office at the White House. But Trump doubled down hours later, chastising the United States' closest ally publicly. He wrote on Twitter, "Don't focus on me, focus on the destructive Radical Islamic Terrorism that is taking place within the United Kingdom."
. @Theresa_May, don't focus on me, focus on the destructive Radical Islamic Terrorism that is taking place within the United Kingdom. We are doing just fine! He initially used the wrong Twitter handle for May and later deleted the tweet and corrected it. For several minutes, someone by the name of Theresa Scrivener, with six followers and nine tweets, was unwittingly thrust into the spotlight. May's office struck back this morning. "The prime minister's record, both as prime minister and home secretary, points to her … [focus on terrorism]," her spokesman told ABC News. He added, "It is clear that over her time as home secretary and as prime minister and in the wake of the tragic events over the summer, the prime minister is fully focused on dealing with extremism," referring to a string of terrorist attacks in the U.K. this year. But many British politicians immediately called for May to rescind her invitation to Trump. London Mayor Sadiq Khan released a statement saying, "President Trump yesterday used Twitter to promote a vile, extremist group that exists solely to sow division and hatred in our country." "I have previously called on Theresa May to cancel her ill-judged offer of a state visit to President Trump. After his latest incident, it is increasingly clear that any official visit at all from President Trump to Britain would not be welcomed." Communities Secretary Sajid Javid echoed Khan, saying Trump's tweets "endorsed the views of a vile, hate-filled racist organisation." Foreign Secretary Boris Johnson tweeted that Britain First has "no place" in British society. Bone, the Conservative member of Parliament who suggested that May get Trump to delete his Twitter account, said, "One of the advantages of having such a special relationship with the United States is when a friend tells you you've done something dreadfully wrong, you tend to listen." U.K. Home Secretary Amber Rudd responded to Bone, saying, "We all listen more carefully, perhaps, to criticism from our friends than from people who we don't have a relationship with ... It's interesting to note my honorable friend's advice regarding Twitter accounts. I'm sure many of us might share his view." Rudd echoed May's statement, saying this morning, "President Donald Trump was wrong to retweet videos posted by the far-right group Britain First." She called the tweets "full of hate" and "wholly unwelcome" but reminded Parliament of the special relationship with the United States. Labour Party MP David Lammy weighed in to say Trump is "promoting a fascist, racist, extremist hate group" — a view held by the majority of those who took the floor today. 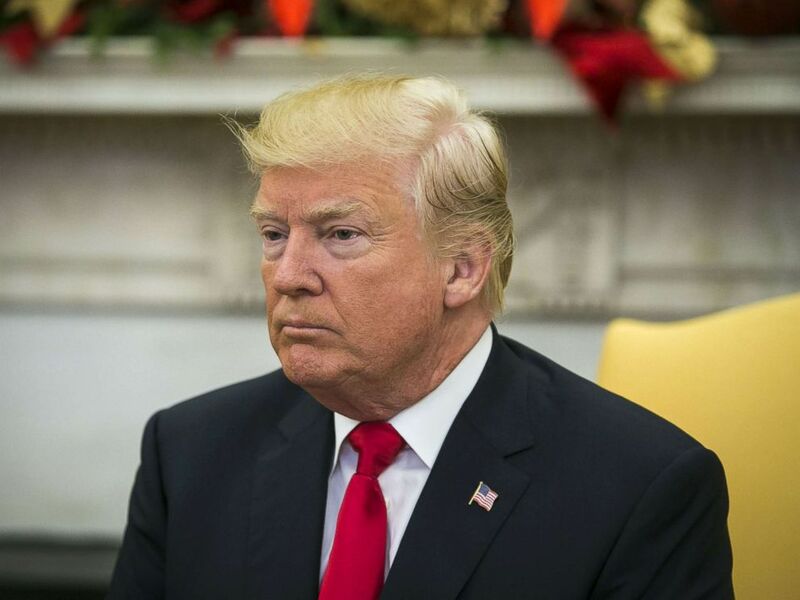 Naz Shah, also a Labour Party MP, said, "No modern American president has promoted inflammatory content of this sort from an extremist organization. Not only has the commander-in-tweet done this, he has defended it, publicly chastising the British prime minister for her comments."